. 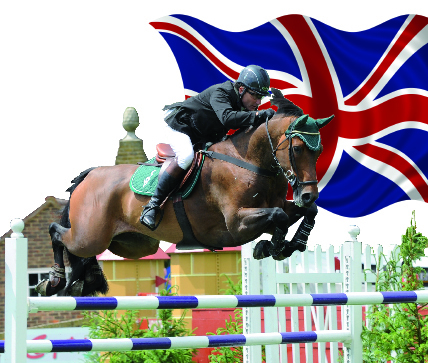 :: “STARS OF THE FUTURE” SALE ESTABLISHES UK’S REPUTATION FOR WORLD CLASS SHOW JUMPERS ::. Vindicat W, show jumping Gold Medal winner at the London Olympics, was bought as a 5-year-old five years ago at the “Stars of the Future” sale organised by leading UK auctioneers Brightwells - a clear indication of the growing reputation of this prestigious UK sale for attracting horses of world-class potential. Top show jumper Peter Charles paid £54,000 for Vindicat W at the sale and following an illustrious career – culminating in the Gold Medal win at the London Olympics - he has now been sold Jessica Springsteen, daughter of rock star Bruce Springsteen. “There’s no doubt about it – the international audience is starting to sit up and take notice of the ‘Stars of the Future Sale’ which has become a leading marketplace for talented show jumping prospects. And there’s no better example than Vindicat W,” said auctioneer Richard Botterill of Brightwells. The sale has been responsible for a host of success stories including the Grand Prix horse Super Trooper de Ness and many other horses still coming up through all championship levels with top riders such as Michael and Robert Whittaker and Shane Breen. “The UK may not always have been somewhere buyers would expect to find horses of this calibre but so many top-class show jumpers have now been bought at this sale that it’s rapidly establishing a world-wide reputation. “Every year we’re seeing more international buyers. Last year we had bidders at the ringside from the USA and Canada, Russia, Switzerland and Germany,” added Richard Botterill. This year’s “Stars of the Future” sale takes place between Thursday December 1st and Saturday December 3rd within the outstanding equestrian facilities of Addington Manor, Buckinghamshire. As always buyers will have the opportunity of fine dining during the sale. The format that Brightwells has developed for the “Stars of the Future” sale has been widely applauded by buyers and played a key role in its continuing success. All horses are pre-selected from several countries across Europe providing buyers with depth in quality and type. Brightwells have built a strong relationship with many European breeders and this year’s sale will include outstanding show jumping horses from Holland, Belgium, France and Germany including two, three, four and five-year-olds. Brightwells’ agents play a critical role in ensuring the success of the sale and are responsible for finding so many top quality young horses with world class jumping potential. “All horses undergo the strictest pre-sale selection and veterinary checks including a full X-ray procedure which we believe is second to none. As part of our service we can organise accommodation for international buyers and assist with all export documentation and requirements,” said Richard Botterill. The “Stars of the Future” sale will also include an exciting catalogue of dressage horses from leading European breeders and producers as well as a selection of young eventing horses. All entries will undergo the sale’s strict selection procedure and excellent trial facilities will be available.